Long time upriver neighbor Christie Fairchild knows our area about as well as anyone, so it was great today to get her observations about the proposed quarry mine near Marblemount. Here are Christie’s important observations, some of which have not yet been discussed with the serious consideration they deserve. 1. The site was a 5-acre gravel pit, NOT a 600-acre rock quarry. But they think they can “grandfather” it in by calling the current use a “quarry”. (It has not been used, except for once in a blue moon, for YEARS, and only for surface gravel). 2. 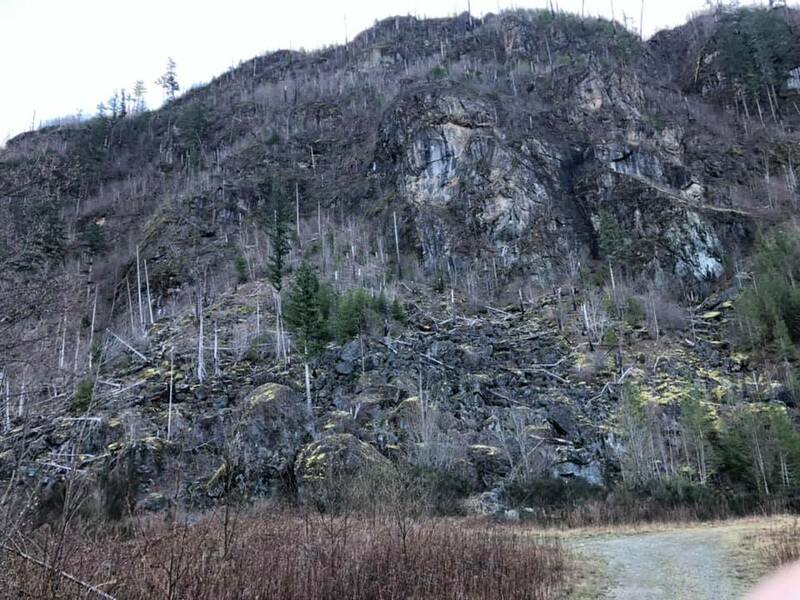 The extensive fire scars you can see up there were caused by ONE spark in that gravel pit 20 years ago. It became the Jordan Creek Fire. Imagine what a full blown, blasting quarry could cause! Especially with all that dead timber! 3. This site is in an active seismic and erosion zone. Do we really want another Oso? We get over one-hundred inches of precipitation up here annually. While Hazel Hill (Oso) was/is a hill of glacial outwash and clay deposits and, yes, undercut by a river, it’s important to appreciate that hills with dissimilar geology can have similar risks! Big Bear is right on top of a seismic fault and we get tremendous precipitation up here, which will be, of course, exacerbated after clearcutting. Once the rock face has been fractured by blasting, it can only respond to gravity and fall DOWN (on top of homes, etc.) This risk has been identified as such in Kiewit’s proposal (“high seismic and erosion risk” area). 5. This site is directly above the Wild and Scenic Skagit River, just east of the Wild and Scenic Illabot Creek and just west of the Wild and Scenic Cascade River, as well as the world renown Bald Eagle Natural Area Preserve. 6. 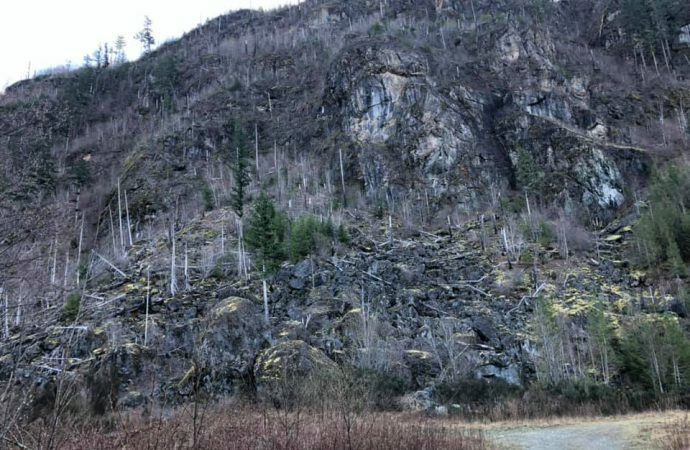 The proposed quarry mine faces due north, reverberating the blasting, construction noise, and concussion across the river, Hwy 20, and the towns of Marblemount and Rockport – gateway communities to North Cascades National Park and totally dependent on tourist dollars for our very existence. 7. Many, many land management agencies, including Seattle City Light, oppose this project! AND Kiewit Company doesn’t even have an Environmental Impact Statement, much less a complete proposal. There are just too many holes in it to count. 8. Kiewit has a terrible reputation and currently has over 68 water quality violations on other projects. In addition, they have just bought up all the land they need for over TEN times the listed value! ($45,000 vs almost $500,000).